Very happy to announce A Perfect You is now available on Vimeo for all those who missed it at the various festivals. This little film garnered a “best actress in a short” award for lead Rashieda Awan. Music by my pals Chris Heslop, Bennie Sims, and Alex Meixner make this a must see film. 99 cents to rent, $1.99 to buy. You can’t beat the price. According to the World Health Organization, a murder in the United States costs the American taxpayers 2 million dollars. First off there’s the loss of productivity and wages the victim would have earned. Then there are the costs incurred during the processing of this murder. The investigation, the prosecution, the incarceration. There are additional costs if the victim is hospitalized prior to death. With roughly 15,000 murders a year committed in the U.S. that ciphers out to 30 billion bucks. It’s a luxury I don’t think we need. According to the Bureau of Justice Statistics, most murders are committed against someone known to the perpetrator. Sadly many of these people are victimized by intimate partners. It’s hard to believe, let alone understand, that truth. The key to preventing such horrible acts is education. There are red flags in a relationship that can indicate a person is at risk. But currently we are not educating ourselves as to what these red flags are. What if there was a vehicle for disseminating this important information? Would you help to get the word out? If the answer to that question is yes, then get yourself over to the crowdfunding site for the film, “Finding Jenn’s Voice,” and make a donation. The very purpose of this film is to educate and help those of us at risk for intimate partner violence (IPV). It explains what IPV is, how to recognize it, and how to prevent it. The film’s producer, Tracy Schott, is only 22% funded at this point. She’s half way through the campaign. If she doesn’t reach her goal she will not get her funding. She will not finish the film. It will not get distributed. The word will not reach the people who need to hear the message. The FBI has reported that 11,766 American women were killed by IPV between 9/10/2001 to 6/6/2012. According to the Center for Disease Control, every day more than 3 women are killed by their intimate partners. You can do something about this. You can help educate people. All you have to do is give ten bucks to the film. Ten bucks now might just prevent a 2 million dollar bill later on. And it’s not just about murder. IPV in all its forms incurs costs to all of us. According to the World Health Organization, from 56% to 80% of the costs of care for gun and stabbing injuries are either directly paid by public financing or are not paid at all — in which case they are absorbed by the government and society in the form of uncompensated care financing and overall higher payment rates. So you are paying for IPV whether or not you are involved, are related to someone involved, or even remotely know someone involved. If you are a million miles away from IPV, you are still paying for it. So do yourself a favor, take one small step in preventing it. 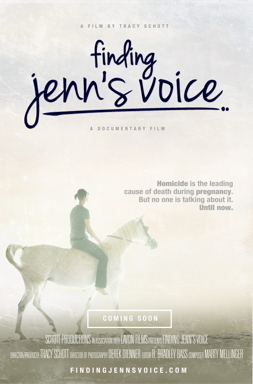 Tracy Schott’s documentary, FINDING JEN’S VOICE, is about half-way completed. She’s still got some shooting and interviewing to do before she begins the editing process. To get all of this done, she’s launching a fund-raising campaign on July 29th. More about this below. Finding Jenn’s Voice concerns the difficult subject of intimate partner violence (IPV). Tracy became involved with IPV when a friend related the story of her niece, Jennifer Snyder, who had been murdered by her boyfriend. The boyfriend was married to another woman at the time and when he discovered Jennifer was pregnant he killed her. Tracy was reluctant at first to work on a project that seemed more appropriate for tabloid journalism. But after doing a cursory search on the Internet, she discovered a horrible fact: murder is the number one cause of death in pregnant women. After overcoming her initial shock, she asked herself what could be done. What could she do about it? Tracy is a movie and tv show producer. The logical answer for her was to use her skills to tell Jennifer Snyder’s story with an eye to educating the world about the larger problem. The result is Finding Jenn’s Voice. In Finding Jenn’s Voice, Tracy is offsetting the sensationalism the media initially gave Jennifer’s story with a clinical look at the wider problem of IPV. The movie will be a clarion call to our society: we must talk about this, we must make ourselves aware, we must change the story. The fundraising campaign for the movie will launch at the end of the month. I’ve signed up to help get the word out. I’ll be following along on Facebook and reporting her progress back here. I’ll also be posting general information on IPV as Tracy continues her research. For more information on Finding Jenn’s Voice, visit the website. To help in these pre-launch days, you can “like” the Facebook page for Finding Jenn’s Voice, and pass along this information to everyone you know.